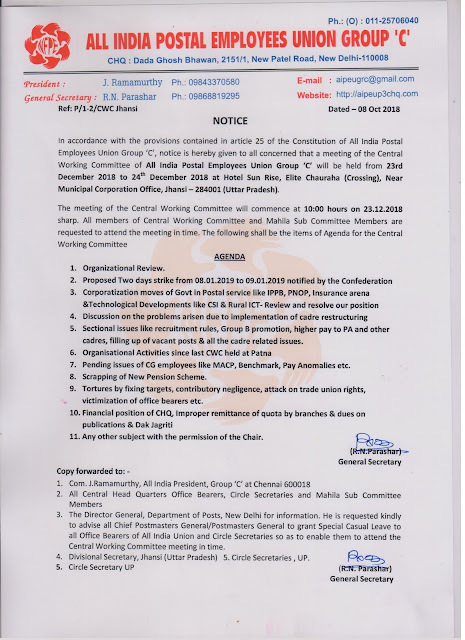 In accordance with the provisions contained in article 25 of the Constitution of All India Postal Employees Union Group ‘C’, notice is hereby given to all concerned that a meeting of the Central Working Committee of All India Postal Employees Union Group ‘C’ will be held from 23rd December 2018 to 24th December 2018 at Hotel Sun Rise, Elite Chauraha (Crossing), Near Municipal Corporation Office, Jhansi – 284001 (Uttar Pradesh). 5. Sectional issues like recruitment rules, Group B promotion, higher pay to PA and other cadres, filling up of vacant posts & all the cadre related issues. 7. 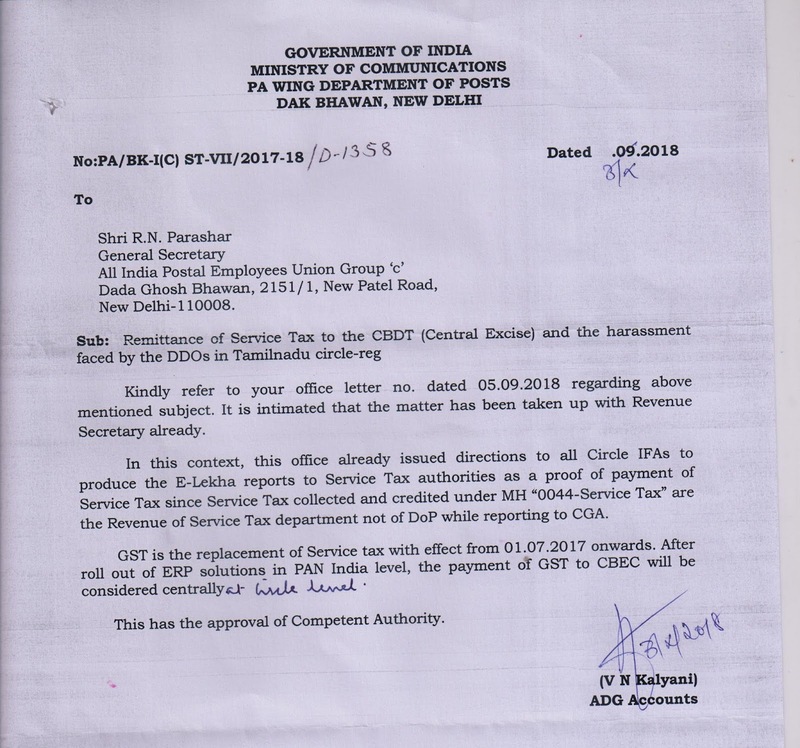 Pending issues of CG employees like MACP, Benchmark, Pay Anomalies etc. 8. Scrapping of New Pension Scheme. 9. Tortures by fixing targets, contributory negligence, attack on trade union rights, victimization of office bearers etc. 11. Any other subject with the permission of the Chair. 3. To The Secretary / Director General, Department of Posts, New Delhi for information. 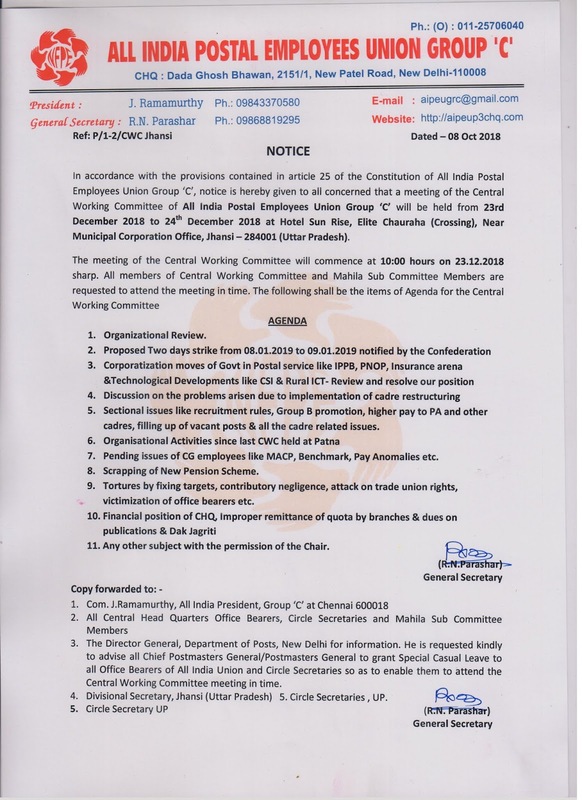 He is requested kindly to advise all Chief Postmasters General/Postmasters General to grant Special Casual Leave to all Office Bearers of All India Union and Circle Secretaries so as to enable them to attend the Central Working Committee meeting in time. 4. Divisional Secretary, Jhansi (Uttar Pradesh) 5. Circle Secretaries , UP. M.P. P-III Circle Conference was held at Balaghat from 7th to 8th Oct- 2018. Comrade R.N Parashar S/G – NFPE & G/S-P-III attended the conference. Comrades S.C Jain (Bhopal), R.K Chaubey (Sagar) & S.C Gupta, (Sehore) were elected as President, Circle Secretary and Treasurer respectively. P-III CHQ conveys congratulations and revolutionary greetings to the newly elected team.